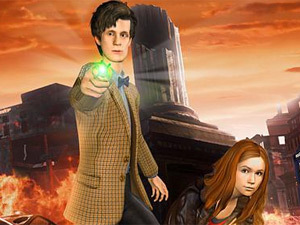 Doctor Who: The Adventure Games has been shelved by the BBC. Executive producer Simon Harris said that the firm will now focus on other Doctor Who game projects instead. "Right now there are no current plans to develop any more Adventure Games, so [The Eternity Clock] is the next Doctor Who gaming exercise and we're doing other things, obviously we've got the browser-based MMO Doctor Who: Worlds In Time, we have other plans for other platforms and formats and we'll be announcing those. "But right now The Adventure Games have done a great job, and they've been done, we're now going to move forward with the The Eternity Clock and we'll continue to develop those plans as we go ahead." probobly because they cant make money on it. i never played any past the first but my laptop is a bit pants lol.. I found them a bit tedios, they were quite easy but a bit boring and it took about 20 seconds just to climb over a little wall. Shame they've been shelved though. I'm really anoyed that The Eternity Clock is coming to PC and PS3 but not Xbox 360, thats a load of bullsh*t right there.